[INQ. NO. 1508M01] BHI is a world-leading supplier of heat exchangers, including heat-recovery steam generators, which have been awarded the World Class Product of Korea 2012 by the Ministry of Trade, Industry and Energy of Korea. With astonishing achievements in HRSG (Heat Recovery steam generator)fin tube coating technology, BHI has coated HRSG fin tubes with porcelain enamel, which have been co-developed by KOSPO and Ujin. This coating technology will prevent corrosion at dew points and enhance the durability of HRSG fin tubes, without compromising the heat-exchanging capabilities. Shin-Incheon project is the first HRSG in the world with enamel-coated fin tubes, and BHI is hoping to apply this technology further to other projects. Utilizing LNG fuel, HRSG operates the gas turbine used for existing thermal power generation, collects high-heat waste with a recovery device, and operates the steam turbine. HRSG is an environment-friendly power generating device that efficiently produces electric power by a two-step process. Hence, it is considered to be mandatory equipment for a combined thermal power plant. Based on self-developed technologies, BHI produces high-quality products that minimize pressure loss and maximize heat transfer. BHI contributes to energy saving and environment protection by efficiently recycling high-temperature exhaust gas energy. BHI designs and manufactures high-quality products based on a license agreement with Foster Wheeler that was made in 2005, and technological know-how and experience. BHI HRSG has superior design features, which allow products to be more reliable and people to have easier maintenance service with its long warranty BHI has incorporated global design and fabrication capabilities in order to meet customers’ needs. [INQ. NO. 1410M04] NS Korea has plentiful experience in manufacturing of liquid ring vacuum pumps, heat exchangers, vacuum pump packages and pressure vessels for global clients with the goal of becoming a leading company in the business of Heat Exchanger & Pressure Vessels. 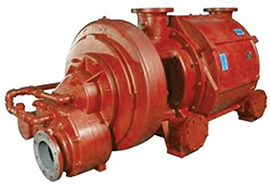 Liquid Ring Vacuum Pump: The NSKV two stage vacuum pumps provide reliable high-vacuum performance in the power industry. It features integral two-stage liquid ring vacuum pumps with improved performance at vacuum levels down to 0.8”h HgA (27mbar). It is designed to handle large amounts of liquid carryover without difficulty. Heat Exchanger: NS Korea produces all kinds of heat exchangers used for efficient facilities for heat recovery in petrochemicals, power generation, etc. and the company also is engaged in developing and producing custom-made next-generation heat exchangers, including coolers, condensers, reboilers, evaporators and preheaters through connection with HTRI program. NS Korea is involved in designing and producing heat exchangers for ocean water and special materials. 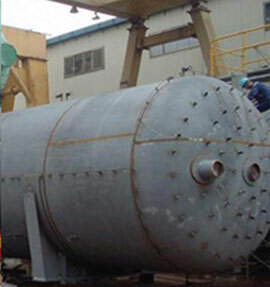 Pressure Vessel: All the pressure vessels of NS Korea are designed according to the ASME Code for Pressure Vessels. 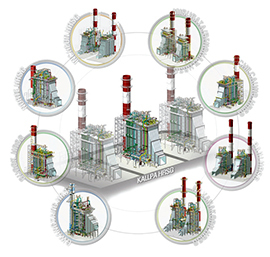 Section VIII Division.1 and products include storage tanks, holders, reactors, columns or towers. BHI is a world-leading supplier of heat exchangers, including heatrecovery steam generators, which have been awarded the World Class Product of Korea 2012 by the Ministry of Trade, Industry and Energy of Korea. With astonishing achievements in HRSG (Heat Recovery steam generator)fin tube coating technology, BHI has coated HRSG fin tubes with porcelain enamel, which have been co developed by KOSPO and Ujin. This coating technology will prevent corrosion at dew points and enhance the durability of HRSG fin tubes, without compromising the heat-exchanging capabilities. Shin-Incheon project is the first HRSG in the world with enamel-coated fin tubes, and BHI is hoping to apply this technology further to other projects. Based on self-developed technologies, BHI produces high-quality products that minimize pressure loss and maximize heat transfer. BHI contributes to energy saving and environment protection by efficiently recycling hightemperature exhaust gas energy. BHI designs and manufactures high-quality products based on a license agreement with Foster Wheeler that was made in 2005, and technological know-how and experience. LHE Co., Ltd is a heat exchanger manufacturer producing a wide range of heat exchangers such as plate heat exchanger, spiral heat exchanger, oblong heat exchanger, plate coil heat exchanger, bloc heat exchanger, etc. Plate Heat Exchanger, one of the main products of LHE Co., involves bringing two substances at different temperatures close to each other so that one either heats or cools the other. And it uses heat transfer plates fitted with gaskets that seal off each channel from the next and direct the fluids into alternate channels. Oblong (Shell & Plate) Heat Exchanger combines good features Plate Heat Exchanger and Shell & Tube Heat Exchanger. Oblong Heat Exchanger is designed to be very compact compared with Shell & Tube Heat Exchanger. The Spiral Heat Exchanger is constructed of two long metal strips rolled around and open split center forming two concentric spiral passages, one for each fluid. The transferred counter flow enables heat exchange for tiny temperature difference, and thus the spiral type is optimized for saving energy. The remarkable feature of LHE Bloc heat exchanger is to enable operation under higher pressure and temperature due to greater mechanical strength by welded structure without using interpolate rubber gaskets. LHE’s heat exchangers are now exported to countries such as Saudi Arabia, China, Japan, Canada and the U.S.A. In the nation, they are supplied to major corporate customers including POSCO, Samsung Electronics, STX Offshore & Shipbuilding, LG Chemical, Daewoo Shipbuilding & Marine Engineering, Hyundai Engineering & Construction, GS Engineering & Construction, etc. If you want more information about ‘LHE Co.’, please contact us.